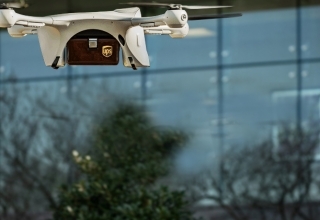 Every day, the market for unmanned autonomous vehicles (UAV), or drones, is exponentially growing; that’s because their applications have become seemingly endless. 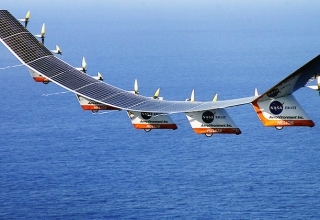 However, the buzz about the UAVs also prompted legislative parley over their pros and cons. As a result, the Federal Aviation Administration (FAA) published the 14 CFR Part 107—Small Unmanned Aircraft Systems in 2016, which stipulates the terms and conditions of drone usage within the United States soil and airspace. However, the FAA guideline is loose and the federal’s response lags behind, which forced states, cities, and towns to enforce local ordinances. 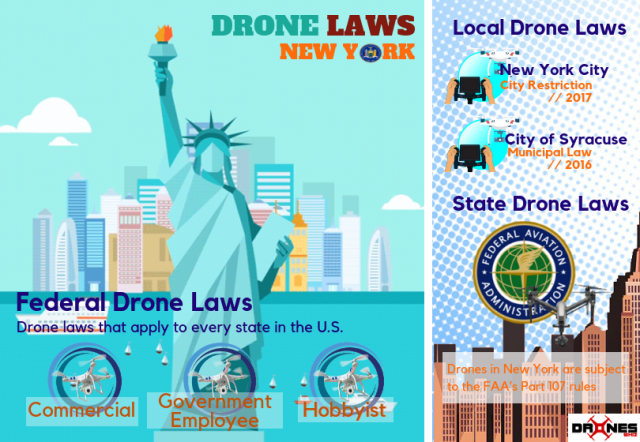 The state of New York is one of the top destinations of tourists and locals, the majority of whom think that the state’s drone laws aren’t as rigid as the others’. But it’s actually hard to tell where to fly in-state, especially when there are other local ordinances related to drone regulation. 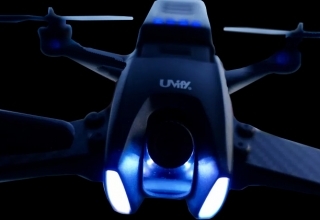 It is important to note that the state and local governments are prohibited from creating ordinances, in fears of passing pieces of legislation that are contradictory to the rules applicable to small UAVs. Thus, it has been established that the FAA’s drone code is the sole legal document that regulates the use of drones. 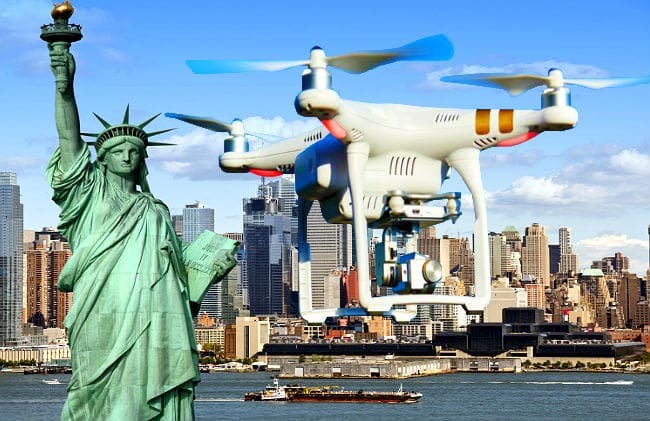 Generally, a drone pilot has requirements to meet should they want to fly a drone in New York. 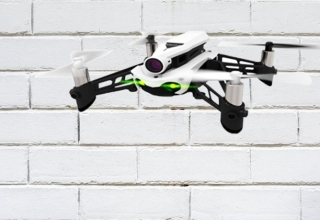 The requirements vary with every drone purpose. The aircraft must be registered with the FAA, and the operator must follow the Special Rule for Model Aircraft. 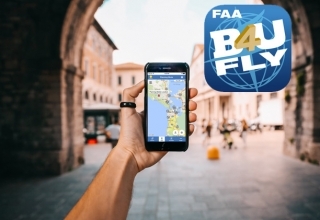 The aircraft must be registered with the FAA, the pilot must be an FAA-certified drone pilot, and both aircraft and pilot must observe the rules declared in Part 107. The government can act as civil operators (governed by regulations of National Airspace System) or public aircraft operations (through part 107 of FAA). For the latter, a Certificate of Authorization (COA) must be acquired. When operating beyond the provisions of the FAA, the pilot operating the UAV must request a Part 107 Waiver to deviate from the rules. Although contradictory ordinances are not permitted, FAA reiterated that states and cities can still regulate takeoff and landing sites within their territorial boundaries. This is to ensure public safety. The city of Syracuse, for example, banned the use of UAVs for government purposes until sufficient federal and states laws are promulgated. In addition, the FAA holds the prime duty to enforce penalties such as suspension of pilot certificates, conducting civil proceedings, and fine up to $200, 000 upon violating any provisions in Part 107. However, when a pilot’s negligence also results in violations of criminal statutes, litigation based on constitutional, state, or local laws may proceed. Currently, the FAA proposes new amendments in order to fill the loopholes of the existing drone code. 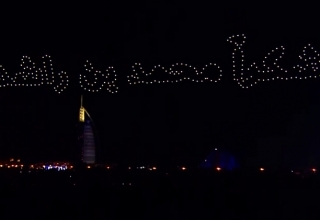 The proposed amendments include the allowance of drone pilots to operate at night and over people without securing a waiver. Once in place, this will also serve as drone laws in New York state.